The Hindenburg, The Titanic, Hamlet Isn't Dead's Henry VI trilogy: all great vessels must have a swift and confident captain. And heading the voyage into Shakespeare's earliest historical thrillers is none other than James "Robin" Rightmyer Jr.
We sat down with the scurvy dog at the helm of this incredibly complex repertory production to find out if these centuries-old plays are still shipshape. We'd show you his "sea legs", but that might be going overboard. D: Afternoon, Captain Rightmyer. How are you? Did you sleep well? RR: I'm very well, thank you. And yes, I slept fantastically. Dreamt of and in iambic pentameter. It's a skill. D: Impressive. Okay, let's dive right in. It may sound a bit esoteric, but honestly, why this play now? Besides the whole chronology thing, how are these plays relevant to today’s audience? RR: Well. . . that's kind of a trick question, isn't it? Shakespeare's plays are always relevant. That's why we're still doing them four hundred years later. But this Henry cycle I think in particular is relevant due to it's themes of gender. Right now more than any other time that I can remember, there is a hugely popular feminist movement. This cycle deals with a lot of women struggling to make it in a patriarchal society, which I think resonates a great deal today. D: Very true. Now, you’ve done a lot of gender-bending in this production. Any specific reasoning or inspiration there? RR: Some of the gender-bending is purely practical. When doing any of Shakespeare's plays in rep, there's always a problem in that there might be 20 male roles and 3 women; Henry VI is no exception. And we always see tons of talented women at the auditions, so it's great to be able to use them. On the other hand, a few roles that have become women in this show (Suffolk being the prime example), I made more as conceptual choices to emphasize the theme of women in a male-dominated society. D: And, as we know from Hamlet Isn’t Dead in the past, you’re all very good at rolling with the proverbial punches. What have been some of the unforeseeable difficulties in the rehearsal process so far? RR: Well, as is always the case, actors have lives, too, so sometimes conflicts get in the way of rehearsals and performances. In this particular show we had to recast three tracks the night before the read-through. However, in this instance I'm extremely happy with the cast that we have now -- we have an exceptionally talented and driven bunch. D: That's good to hear. Okay, this one’s off-topic, but if you could marry any character from Shakespeare’s canon, who would it be and why? RR: I've always had a bit of a soft spot for Viola. Or Rosaline, from Romeo and Juliet. She's totally hotter than Juliet. And probably is older, too. D: Nice choices. Anything else about the upcoming theatrical trio we should know? RR: This project has been on my dream list for a long time now. I'm excited to be directing it and can't wait for it to go up! Go Lancaster! Oops. There you have it folks. You're going to want to wear a life jacket to this production, because it's obviously awash in theatrical talent. 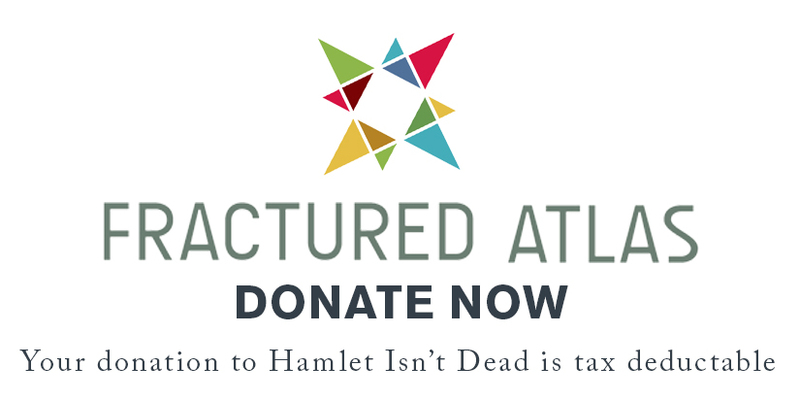 In a world full of misogyny, inequality, and ignorance, Hamlet Isn't Dead is your little island oasis of love. What, do we have to spell it out in semaphore for you? Don't miss this show! !